The trees are glowing white. They are fully dressed and await the wind’s call. And she does not come out to play. Dawn slowly tip-toes, blueing the sky. I am lost on a path so familiar. With a key that only belongs to dawn? They seem unrealistic against the early light. Windows lit here and there, like the fading stars. My voice –the only echo remaining in the world. The sun rows the moon across the sky, claiming its throne. And I step into the day drunk with awe. LEAGUE OF CANADIAN POETS: What inspired you to write “Dawn”? 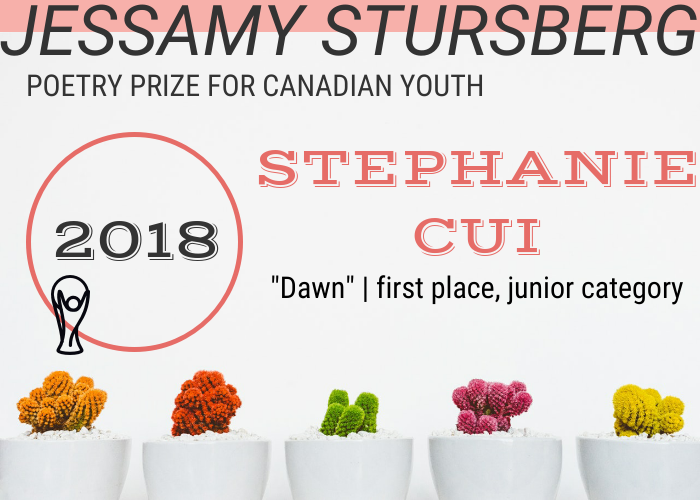 STEPHANIE CUI: My poem “dawn” was based on my true experience with my uncle in an early morning. SC: I’ve been writing poetry for almost four years, ever since I came to Canada in 2014. SC: My favourite poet is Charles Baudelaire. SC: One of my favourite books is Frankenstein. During spring break, I traveled to Ingolstadt — the town where Frankenstein created the monster. Now the novel fascinates me even more. SC: I will always express myself through writing, and I think there’s always room for improvement. SC: I would tell them that no one is ever free, but let your writings be free. SC: My poems originate from my everyday life, but they can give my memories new meanings. Then, these memories would stay with me forever.